Before submitting your unbounce template, ensure that your item meets the following requirements outlined in this article. You must provide sufficient documentation to help customers with installation and setup. Unbounce has provided the following guidelines to assist you in this. If you do not have an unbounce account, you can start a 30 day free trial. If you do have one, sign in at http://app.unbounce.com. If you are not on the All Pages screen, click the Pages button in the left navigation. 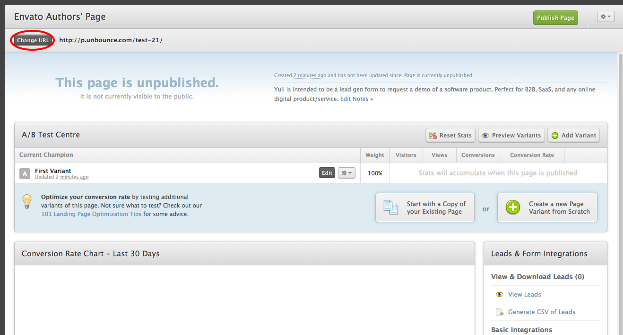 At the top-right of the All Pages screen, click Upload an Unbounce Page. Click Choose File and find the .unbounce file you would like to upload. Your page should be uploaded as a new page into your All Pages screen. A landing page template should be customizable. The end user should be able to easily swap out any hero shot images or photographic backgrounds. Do not edit the source of a text element. Leave page guides and section guides turned on. Margins in page sections should be used to create gaps, not blank page sections. Placeholders are images and easy to swap out. Any custom stylesheets or Javascrips need to begin with a comment including the author’s contact info and instructions for support. Your tree structure can have no broken elements. A form’s button must be properly attached to the form. If your template includes a form, the Conversion Goal should be set to Form Submission. Your template should be mobile responsive, and should have the Show Mobile Responsive option checked. Submission must be a zipped unbounce file exported from the unbounce platform. The following article will provide you with a step-by-step tutorial for creating an unbounce template: The ThemeForest Author’s Guide to Unbounce Templates. Go to the Page Overview screen (the screen before you enter the page builder) and click Change URL. Enter the URL that you would like. The free account will only allow you to change the URI and keep the domain as http://unbouncepages/, which will work just fine for submitting your templates to Envato. Upgrading to a paid plan will allow you to add a custom domain if you wish. To publish your page to the URL you have selected, click Publish Page. A few second later, you’ll have a functioning preview URL.